Exfoliation is one of the most important skincare steps for healthy, radiant skin. Regular exfoliation removes dead skin cells providing immediate and visible results to reduce the appearance of fines lines and wrinkles, open pores, pigmentation, acne scarring, and so much more. Refill products and attachments are available to purchase separately. 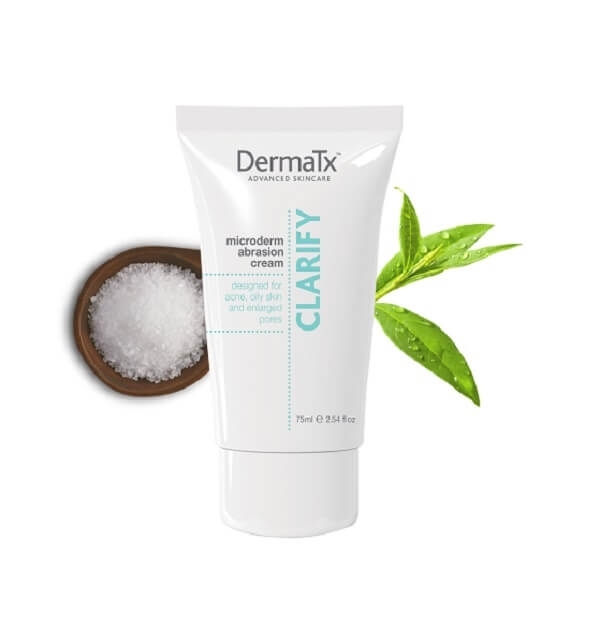 DermaTx Clarify Microdermbrasion Cream - Designed for acne, oily skin and enlarged pores. 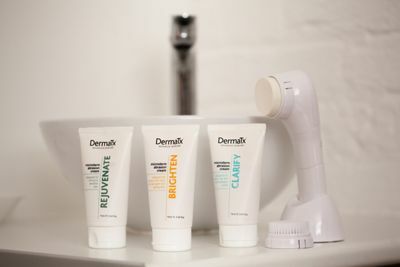 DermaTx Advanced Skincare brings you the benefits of microdermabrasion by introducing its range of microcrystal cosmeceutical creams for use in the comfort of your own home. Deep purifying cleansing gel formulated with acne-fighting 2% Salicylic Acid. Exfoliates the skin to unclog pores, helping to control acne and prevent future breakouts. Use once or twice a day. For best results cleanse with power cleaning device once a day. Caution: Not suitable for sensitive skin types. Do not use if you have an allergy to aspirin, are pregnant or breast feeding. Do not use on Rosacea, Open Sores, irritated skin or other dermatology skin conditions. Some breakouts may occur initially due to purging of the follicles. Daily use of sunscreen is recommended when using Alpha Hydroxy Acid (AHA) products and Beta Hydroxy Acid (BHA) products due to increased skin sensitivity to the sun. Microdermabrasion - Alumina, Aqua (Water), Paraffinum Liquidum (Mineral Oil), Glyceryl Stearate SE, Salicylic Acid, Caprylic/Capric Triglyceride, PEG-8, Saccharide Isomerate, Sodium Ascorbyl Phosphate, Phenoxyethanol, Cera Alba (Beeswax), Stearyl Alcohol, Cetyl Alcohol, Tocopheryl Acetate, Sodium Hydroxide, Taraktogenos Kurzii (Chaulmoogra Oil), Xanthan Gum, Melaleuca Alternifolia (Tea Tree) Leaf Oil, Magnesium Aluminum Silicate, Leptospermum Scoparium (Manuka Oil), Palm Glycerides, Capryloyl Glycine, Potassium Lauroyl Wheat Amino Acids, Nigella Sativa Seed Oil, Ethylhexylglycerin, Sodium Lauryl Sulfate, BHT, Retinyl Palmitate, Magnolia Grandiflora (Magnolia Bark) Extract, Laminaria Ochroleuca Extract, Citric Acid, Sodium Citrate, Maltodextrin, Beta Glucan, CI 77891, Tocopherol. 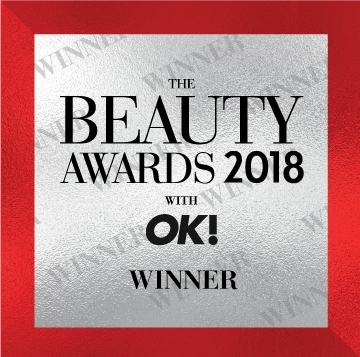 Cleanser - Aqua/water (Purified Water), Sodium Methyl Cocoyl Taurate, Peg-120 Methyl Glucose Dioleate, Cocamidopropyl Betaine, Salicylic Acid, Sodium Chloride, Coco-glucoside, Benzyl Alcohol, Melaleuca Alternifolia (Tea Tree) Leaf Oil, Dehydroacetic Acid, Sodium Hydroxide, Disodium Edta.